This post first appeared over at Real Housemoms where I'm a contributor. 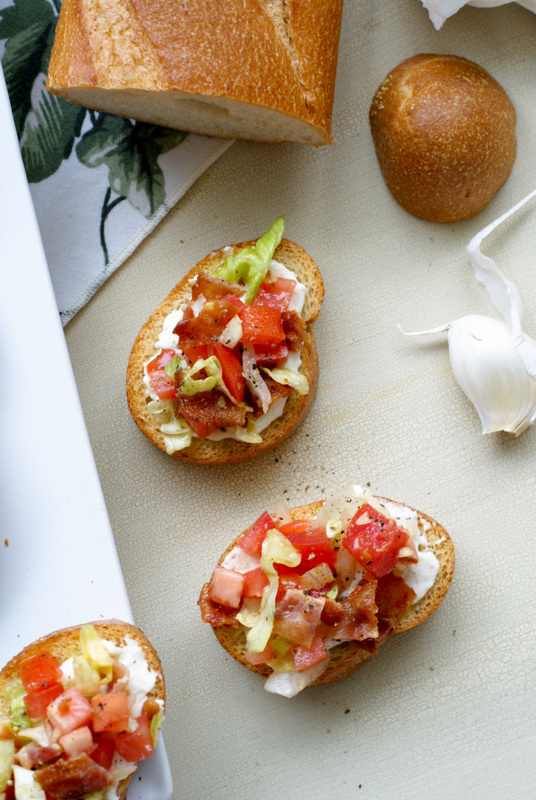 BLT Bruschetta transforms everyone's favorite classic sandwich into an easy to make appetizer that is light enough for brunch and elegant enough for a dinner party! Bruschetta is one of my very favorite appetizers to make for a party because there are so many variation possibilities and it's super easy to make! The most common bruschetta involves olive oil-brushed french bread slices, tomatoes, garlic and some fresh herbs. Classic and absolutely delicious. I like to mix it up a bit sometimes and swap out the usual tomatoes and herbs with things like roasted veggies or shredded meat. Really, there are so many things that taste amazing served on a garlic-rubbed, olive oil-brushed, toasted slices of french bread! 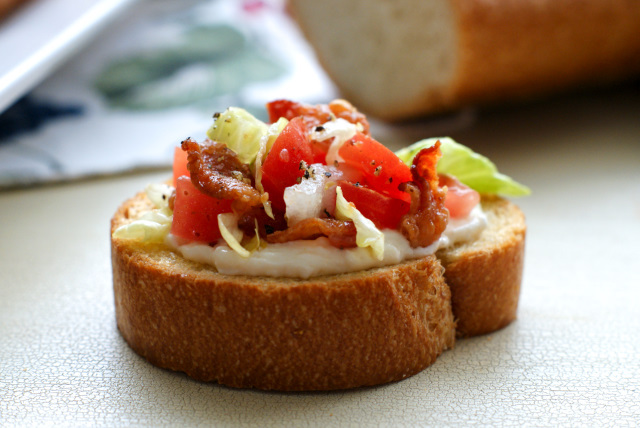 This bruschetta recipe was inspired by the classic American sandwich, a BLT. You know...toasted white bread slathered with mayo, then piled high with thick juicy sliced tomatoes, multiple strips of smoky bacon, and a crisp layer of iceberg lettuce. Kosher salt, black pepper, done and done. Best. Ever. I thought to myself, why not transform that timeless flavor combo into a stellar appetizer that is light enough for brunch and elegant enough for a dinner party? Oh yeah, baby. 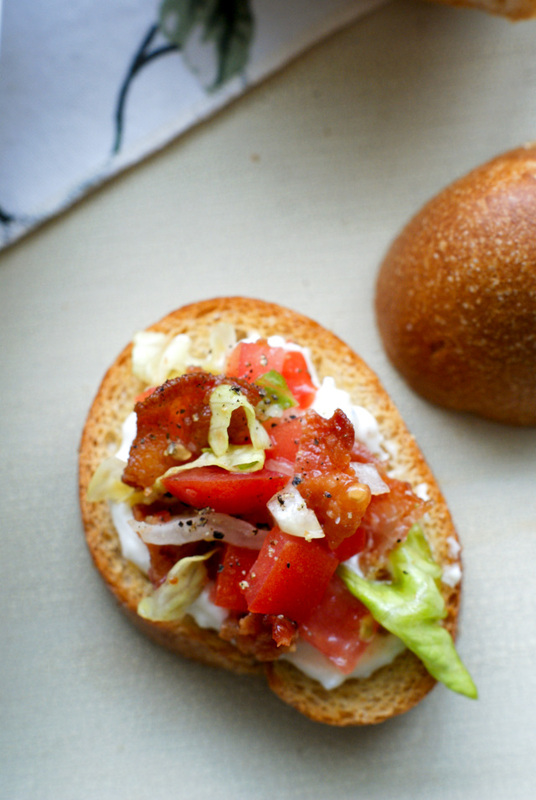 BLT Bruschetta with Goat Cheese Mayo. I grew up on BLTs, but mine were always BLTCs. C for cheese. I am, and always have been, a cheese-aholic. Everything is better with cheese in my book. Naturally I had to add cheese to my BLT Bruschetta! Mixed right in with the mayo is oodles of sharp, tangy goat cheese. Flavor profile elevated 1 million percent! The goat cheese mayo mixture is smeared on to the perfectly toasted bread and it's all crowned with the BLT trifecta. Elegant, easy, freaking delicious. I dare you to try to eat just one. This appetizer is best prepared right before serving to ensure the bacon and lettuce stay nice and crisp. If you're feeling ahead of your prep game and have time to kill before your guests arrive, you can pre-assemble them for easy party time snacking. 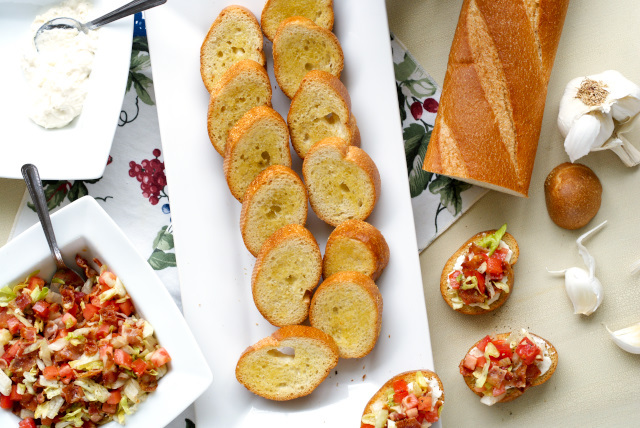 If you are like me and are always pressed for time with a million things to do with no time to spare, you can set up a little bruschetta bar and let everyone make their own! Once you have everything piled up on a slice of toasty bread, magic happens. I know you and your guests will love these from the very first bite! Stir together the mayonnaise and goat cheese until well mixed. Season with salt and pepper, to taste. Cover and refrigerate until ready to serve. Preheat oven to 325 degrees. Arrange the bread slices on an ungreased baking sheet and brush with olive oil. Bake for 10 minutes. Meanwhile, toss the diced tomatoes, lettuce and bacon with 1 Tbsp of olive oil. Remove the bread from the oven and immediately rub each piece with the raw garlic clove. 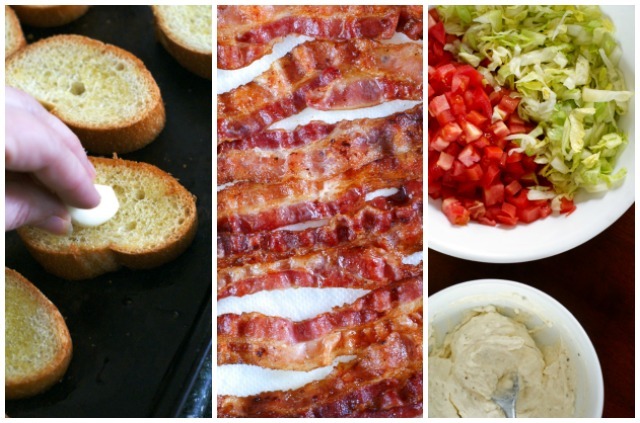 Smear each piece of toasted bread with some of the goat cheese mayo spread and top with a spoonful of the BLT mix. Finish with a sprinkle of kosher salt and fresh ground black pepper. Serve immediately. You can assemble these pre-party or let your guests assemble them on their own! Round out your appetizer spread with a few more of my favorite appetizers! 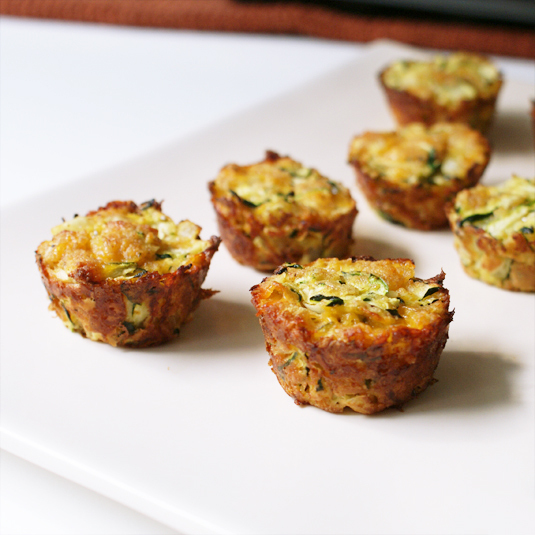 Zucchini Tots are always a hit! 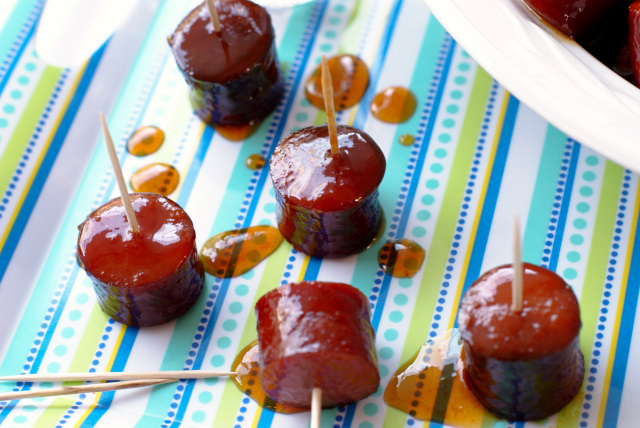 Honey Sriracha Kielbasa Bites bring some zip to the party!